The second edition of the Children’s career fair gathered more than 1600 visitors on November 25 and 26 at the National Palace of Culture. 35 lecturers from different work fields took part in the event where the children could get a closer look at the specially created mock-ups representing the professionals’ activities. The Children’s career fair is part of the Bulgarian network’s “Proud of my parents work” programme. “The choice of profession should be well informed and made responsibly. 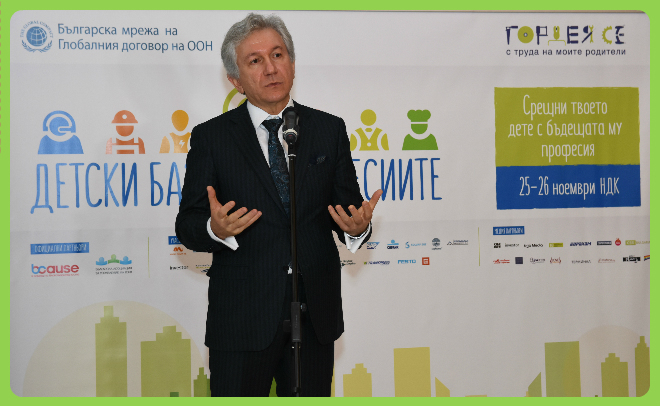 For that purpose it is important that children are given the chance to get acquainted with various types of professions so that they could find their future professional path”, said Mr. Ognian Trajanov, Chairman of the National Council Bulgarian Network of the UN Global Compact and CEO of TechnoLogica Ltd during the opening ceremony of the Children’s career fair. “We can see that more than half of those graduated university do not work in their specialty. This represents a lost personal resource but it also affects the society because those young people did not develop professionally”, added he. The initiative met the youngsters with an engineer, a writer, a vet, an actor, a pharmacist and many more professionals coming from numerous fields, who shared their valuable knowledge about the professions. Apart from the practical workshops where the children could learn more about the professions through interactive demonstrations, the little visitors could also take part in more than 40 TED lectures, presented by 35 lecturers who presented their professions in a colourful and creative way. “The “Proud of my parents work” project strongly corresponds to the values and corporate culture of our company. We believe that our participation is very useful for the children, their parents and the facilitators’ team. The knowledge and experience sharing between us and the companies which have already taken part in the project in the previous editions, was one of the most important elements for us. It is a pleasure working with colleagues who have realised the importance of the social responsibility towards the society and the future”, said Denitsa Borisova from FESTO who is taking part in the project for the firs year. After the end of the Children’s career fair has ended, the participating companies leave with a feeling of satisfaction that they have contributed for the early career orientation of the little guests. The responsible business gave the chance to as many children as possible to get familiar with the importance of labour and its image as the basis of personal satisfaction, self-esteem and professional development.